and hence must be left in a state fit to run. (6). That’s not hard - you just have to remove the shovel plate (7). front of the cab holding it in place, so it would have to slide upwards and outwards at the same time. This was difficult because the ferrules around the washout plugs (8) prevented the cladding moving. curse) out came the cladding piece. With access to the wedge, it was clearly loose. Bruce estimated that there was 1/8 inch gap. We gained access to the wedge on the right-hand side, and this was loose too, but by no means as loose as the left one. These don’t have to be hammered in very hard, as the boiler needs to move as it expands/contracts, but they should be tight. 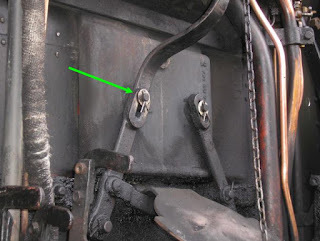 Someone mentioned to Bruce that it is possible for the stretcher between the frames to fracture, which would cause the boiler to move sideways when the loco is in motion. Yours truly slid under the loco (it was not over a pit!) and examined the stretcher - no problems, there. Back in the cab, it was time to extract the wedge for a close inspection … but we couldn’t get it out because it hit the floor plate support frame (9). After attempting to undo the frame nuts & bolts, and finding this an impossible task … angle grinder required! With the frame cut away, finally, the wedge was extracted! 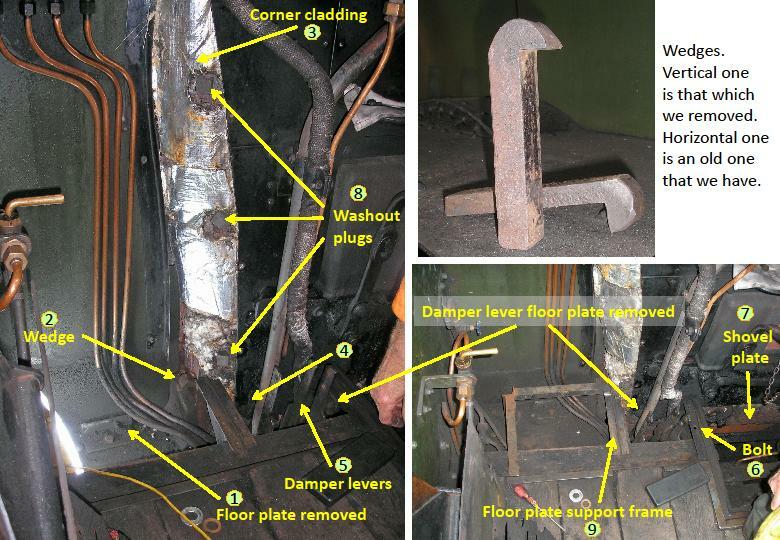 The decision was taken that a shim would be welded onto the wedge to fill the 1/8 inch gap. Gil & Bruce did the measuring, cutting and filing; John P [Loco Dept] welded it in place. Having just cut the floor plate frame, I shortened it a tad such that the wedge can now be removed/inserted more easily (! ), and John P welded that back together for us. As 2807 is still acting as standby loco, we had to leave it serviceable, which meant putting everything back together … except that time marched on, and the cladding didn’t get put back on! While all of this was going on, John G was having a relaxing day applying paint to the tops of 11 boot scrapers. Carpo had performed a washout on 2807’s boiler. Apparently it had a fair amount of sludge - probably due to being filled at Winchcombe (which is not treated water). He took the opportunity to inspect the foundation ring (which is situated just below the fire bars in the firebox. There is still some of the heat-resistant silver paint on the rivets, and they all look in good condition. When I arrived, 2807 already had smoke emanating from her chimney. “Blow!” I said [or some such]. I had a lighting-up training to give, and ours is the only loco in a fit state. Also, David was coming today to carry out some work on the dampers, which will not be possible. David had brought the damper door spark arrester down, which he had modified at home. There is a box-shape within the mesh, and this used to get jammed up with ash, preventing its removal to clean out the ash! So, the Mk II version has a sloping box-section that should avoid getting jammed. He couldn’t fit it, of course, because of red hot cinders constantly or randomly dropping into the ashpan (and hence potentially out of the open damper door … onto him). 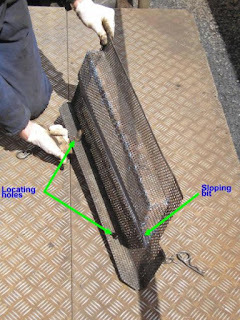 Bruce demonstrates [left] the locating holes; it is because you have to lift the mesh off the lugs that caused the square box-section to jam with ash. Bruce & Gilbert aided by David fitted the corner cladding back in the cab. 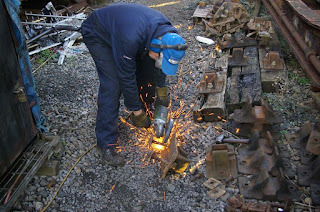 Gil then decided to buzz off to Winchcombe and work on the siphon van restoration. Phil Grange [Loco Dept] was carrying out an “A Exam” on 2807 after the washout. A couple of other guys were cleaning various bits, and Gil had shown one where & how to apply grease. Mostly minor tasks followed. Bruce stamped “2807” on a couple of new spanners. David played with our lathe in an attempt to improve its quality of operation. He took a piece home to fix. Bruce & David decided that the levers operating the firehole doors needed better washers to reduce the play in the linkage. I managed to give Roger T a light-up training session, though some of the checks were not possible to do with a fire in the firebox - it’s a tad too warm to stick your head in and inspect it. Thereafter, Roger T and Clive N [Loco Dept] changed the oil in the tender underkeeps. Mostly, I finished off a few boot scrapers. We ran through the list of outstanding issues, but there was nothing else that we could do today. We are very grateful for the help that the Loco Dept chaps give us.